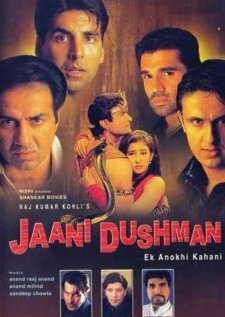 Jaani Dushman (2002) Hit or Flop : Box Office Collections - Checkout Box Office Verdict, Trailers, songs, lyrics, release date and collections of Akshay Kumar, Sunny Deol , Suniel Shetty, Manisha Koirala starrer Jaani Dushman. The movie is directed by Raj Kumar Kohli. It released in India on 16 August, 2002.